Let's hope there is more time dedicated to showing the activities, and not over half the time in the boardroom. I also hope that they don't turn it into a comedy, like last series. I don't like Alan Sugar making stupid jokes and the playing of stupid music during the activities. I wonder who will be "the brand" this year. I really hope this is better than last year. The candidates were either dull, total knobheads or just useless, and there was too much silly editing and emphasis put on the 'entertainment factor' at the expense of the actual tasks. 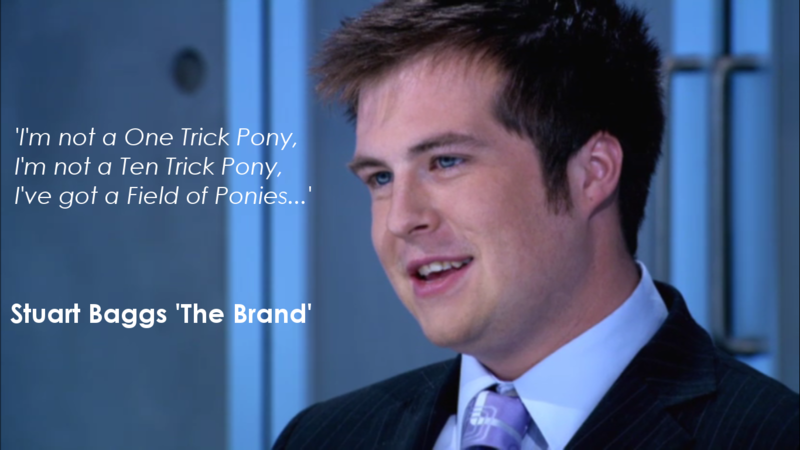 Stuart Baggs just wasn't funny either. Urgh. 1. Frodo? 2. Surely you can feed your habits with other material? Was that the one where they brought cheese from the cash&carry to sell in France? I'll have to catch it an hour later on iplayer, though. Everytime Lord Sugar says "bloody" being one of the rules? Everytime Lord Sugar says &quot;bloody&quot; being one of the rules? That's not very many, and I doubt there'll be much running on the first night. It's Lord Sugar now, he used to be Sir Alan. Yep, saw that on something for the weekend on Sunday. Karen did not look amused, until she realised it was selling stuff! That's just the start of our plan! This should be good! A lot can be learned from these sort of shows too. Anyway, I reckon Tom, Jim, Helen, Ellie, Susan and Felicity will do well in it. I screwed mine up last year by telling them that nothing phases me and I am unflappable. However they did give me a bit of sympathy because when they asked "When's the last time you cried?" I honestly answered "Last night when I found out my boyfriend had cheated on me"
can't wait for tonight am very disappointed that there doesn't appear to be any fitties in the running this year it makes the viewing so much more worthwhile haha! Cant wait for it tonight, shame that mr baggs from the last one was a total pleb.